This is the sixth installment in my series of Graphic Novel Reviews, in which I will publish a review each Tuesday until I run out of books. This is based, in part, on a class that I am currently taking about the graphic novel. Read the next one here (to come next week) or go to last week’s review. Milkyway Hitchhiking is the first manga I’m reviewing, which is surprising since I generally like them. This is a Korean manga that focuses on a magical cat named Milkyway and her travels through space and time. She visits humans and other cats while trying to spread happiness by either giving advice or granting wishes. Though the plot is a series of amusing vignettes which do not allow for much character development, the artwork is so breathtakingly beautiful, and the message is so charming, that I do not care that the plot is weak. Instead, this book is a work to admire and to share with others; it seems very re-readable because of the focus on art. 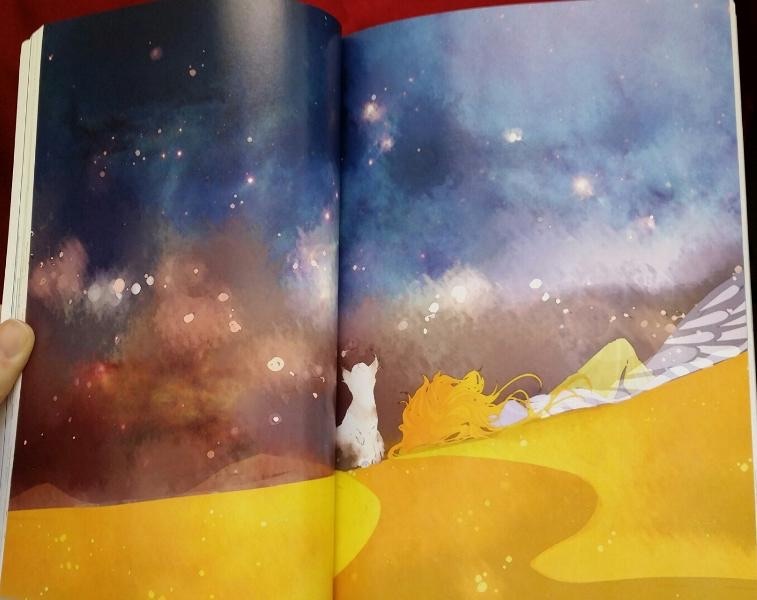 My favorite chapter shows Milkyway meeting the Little Prince from the classic French story. Though it is never explicitly stated that this space man is the little prince, Milkyway knows the fox that the prince once visited who angrily tells Milkyway that she was dumped for a rose. This allusion is what tips off savvy readers to the identity of the lone traveler. While Milkyway follows this strange fellow, he stoically continues to tread across the vast desert to find the place that he believes to be the most beautiful on earth. As a cat lover, I was amused by the focus on the nature of cats. Many of the vignettes portray varying relationships between cats and humans. One young girl becomes a force for good when she realizes feeding stray cats leads to more cat deaths in a dangerous city. In another story, a cat asks Milkyway to help him thank his owner for saving him from a life on the streets. If you’re not a cat person, fear not, for the feline focus will not be distracting, think of it instead as a motif. Overall, the lightness in this graphic novel was a welcome change and though it was not the most literary of works, the characters were likable, adorable, and relatable. The watercolor-esque art was what drew me immediately to this book, and I will seek out the sequel to keep as a coffee table type book to flip through when I feel like being uplifted by this warm, inviting novel.